Kali Katerberg/Daily Mining Gazette Pictured here is the site of the former Smurfit-Stone paper mill, planned as the future site of the Synsel Energy Biofuel plant. Financing for the $300 million project was announced Thursday. 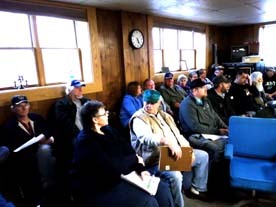 ONTONAGON — After months of waiting, Synsel Energy announced on Thursday that financing terms for construction of a biofuel plant at the site of the former Smurfit-Stone paper mill have been finalized. The $300 million refinery will create second-generation biofuels from pulp and waste wood abundant in the area, Synsel said in a release. “Everything’s been worked out, the i’s are dotted and the t’s are crossed,” said Pat Tucker of Lost Bowl Development LLC, which owns the site. He was unable to comment on the identity of the investors due to a non-disclosure agreement. Securing the funds was a long and slow process but now it is on to the next stage, he said. “The next step of actually putting the plant up is another long, involved process, but it’s done with one challenge and on to the next one,” Tucker said. Lost Bowl Development is contracted to act as co-developer on the property and will continue to be part of the process. Snysel will be involving as many local resources and companies as possible on the project, Tucker said, although some work will be done off-site and require specialized workers. “We don’t have many locals that have built bio-refineries,” he added. Synsel estimates the work will bring hundreds of workers to the area during construction, stimulating the local economy. In the long term, 100 to 150 permanent jobs will be created. “Once construction starts, the local economy will boom,” Tucker said. He believes the plant will be beneficial to the entire region. Next steps in the community include reinstating the railway, dredging the harbor and extending the airport runway for bigger planes. 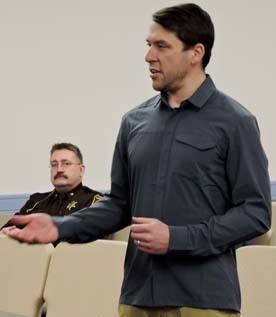 Tucker said he has already received encouraging responses, and Ontonagon’s involvement with Project Rising Tide could be a factor. “I think the governor’s visit here really helped,” Tucker said. State resources available through Project Rising Tide could assist in related economic development, he said. “There’s things we’re going to need that only the state can do for us,” he said, listing issues like restoring the railway and dredging the harbor.